Advantages: Usually the most cost-effective system to install. Provides water at mains pressure or low pressure. Has no moving parts and has the highest efficiency. 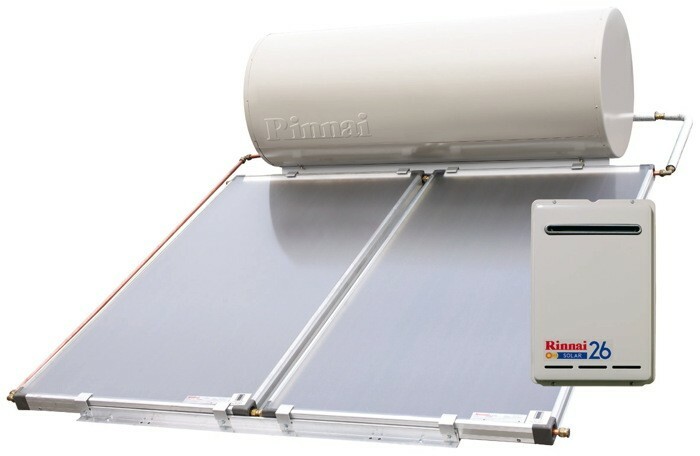 Can also be used as a waterproofed gravity -feed tank for wood heater backup in winter. A good option if a position for a ground mounted tank cannot be found. The tank is located in a roof cavity or if waterproofed, on the roof itself, with the solar panels installed on a north facing roof. 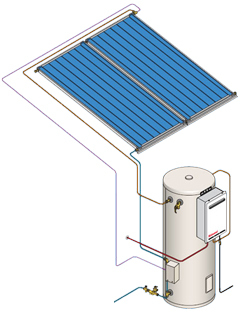 The panels must be below the tank to allow for natural thermosiphon of water from tank down to panels and returned in an upwards flow to the tank. Advantages: Usually the most cost-effective system to purchase. May be directly connected to a wet-back in a woodstove or heater. The tanks lasts a very long time, as they’re made of copper and it sit at gravity pressure.